The Master of Architecture (Design) [MArch(Design)]* is a three-year full-time self-financed programme offered by the Department of Architecture. 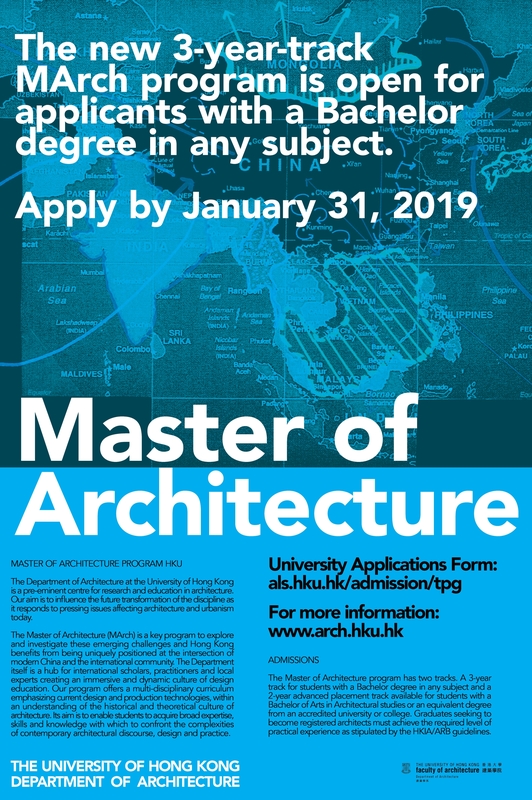 Built on the existing two-year MArch, the three-year MArch (Design) offers a path for qualified students from undergraduate programmes outside of architecture to pursue an architectural education. Hong Kong is situated at the crossroads of modern China and the international community, and within this unique context, the MArch (Design) programme prepares students for the challenges to be faced by architects in the twenty-first century. Graduates of the programme benefit from local expertise, firsthand knowledge of China, and global readiness. MArch (Design) students are immersed in an active culture of service and scholarship, in which disciplinary experimentation is balanced with the teaching of core professional competencies. Through a multidisciplinary curriculum emphasizing current design and production technologies, within an understanding of the historical and theoretical culture of architecture, the programme enables students to acquire broad expertise, skills and knowledge with which to confront the complexities of contemporary architectural discourse, design and practice. *The MArch (Design) programme is subject to University approval. *The MArch (Design) programme is not accredited by the Hong Kong Institute of Architects (HKIA) and the Architects Registration Board (ARB). In accordance with the accreditation procedures, HKIA and ARB will consider the University’s application for accreditation of the degree upon completion of studies of the first graduating class.